Tyngsboro's All-American middie Kyle Laforge will look to lead his Tigers against rival Littleton. 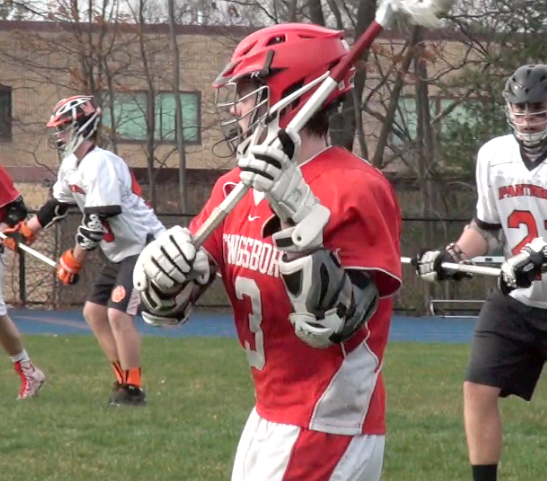 We've already broken down the Division 2 and Division 3 brackets in Central/West, so finally we move onto Division 3 Central East, where rivalries will be renewed, and a few CMass teams will be looking to score upset victories. Here are some quick takeaways from the D3 CE bracket. Bracket courtesy of the MIAA. Click to enlarge. The Raiders are defending Division 3 state champions, and have won three of the last four state titles in D3. D-S is loaded with talent at every position, and remains a prohibitive favorite until somebody proves otherwise. I'm just going to do away with the Dark Horse category and throw all these teams in the contender slots, because I wouldn't be surprised to see any of them score an upset or two. 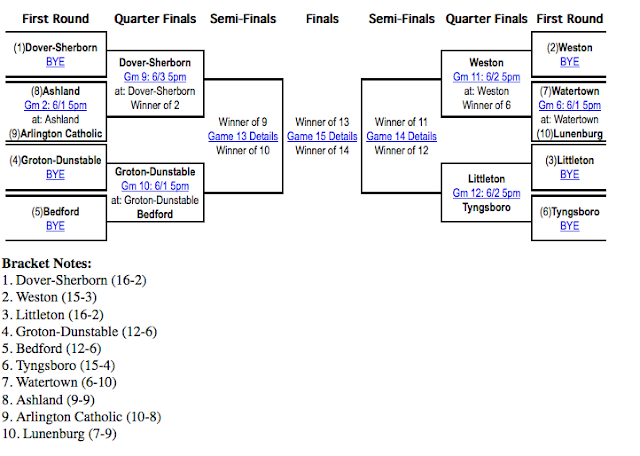 Now, Groton-Dunstable is on the same side of the bracket as perennial power Dover-Sherborn, but the Crusaders have as much talent as anybody else in the bracket, and should be battle-tested after playing a majority Division 2 schedule. 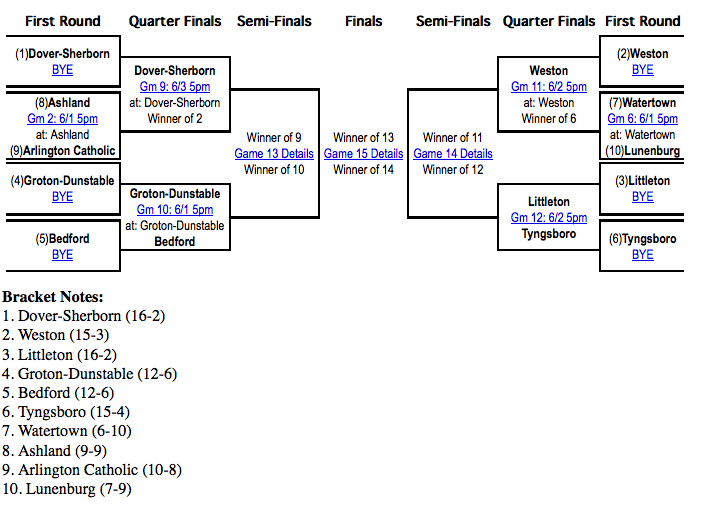 G-D also has wins over Littleton and Tyngsboro to its name, but don't sleep on either of those teams. Those two will have to face each other in the first round, but whichever team emerges from that game could be poised to make a deep run. Led by Griffin Shoemaker and anchored by an underrated defense, Littleton has shown it can play with anybody this year. But, the Tigers' most recent loss came to another set of Tigers: League rival Tyngsboro. Led by All-American middie Kyle Laforge, those Tigers are the hottest team in Central Mass, entering the tournament as winners of 12 in a row. Weston is a talented team, to be sure, but both Littleton and Tyngsboro have enough talent to pull off a minor upset in the semifinals. Ok, this isn't technically a first round game, but both teams have a bye, and I can't think of a better place for a rubber-match between these two squads. Littleton and Tyngsboro split their season series and shared the Mid-Wach B title, and now we get another battle between these two Tiger groups? You'll hear no complaints from me. Saw Weston play Bedford. Neither team impressed me. I was surprised as I expected Weston to be head and shoulders above! They were skilled and athletic but didn't seem very explosive and I think both Littleton and Tyngs could give them all they can handle. Bedford did and Bedford was so so in comparison to the many teams I saw play in CMass this year. You are out of your mind .. No chance against Weston ..
Have you seen them play???? I would have said the same thing. Until I SAW them. I also didn't predict a sure victory. I said that these teams could give them a run for their money. Bedford was within 2 goals late in the 4th and I know both Lit and Tyngs are at least as good ,if not better than, Bedford. Weston has an impressive record, and beat so perennially strong teams but a closer look shows that those teams are in an "off" season. Don't crown them victors yet! Oh, don't get me wrong, Weston is very good. I'm just saying I'd rather be on their side of the bracket that the D-S side. I saw the Warriors play earlier this year against Hamilton-Wenham, and you could tell they were a little off their game, but still controlled it from start to finish. Very skilled group that can beat an elite team like Cohasset when they're playing with great energy. Dover-Sherborn is the team to beat. They have the best face off man in the state solid play from behind the net, and Laidman taking up position out front. Any team that lost to Medfield in OT, without Laidman, and then beat them in the rematch is a title contender. Plain and simple. Dover Sherborn is a machine, and will skate to the final against Grafton. Both Littleton and GD were down, at least, 2 of their starters in the Semis and both made the other team work every minute of the game.. I feel, having seen Weston play Bedford, (final score 13-9 Weston...GD beat Bedford 16-5 down their players mentioned) that a full strength Littleton or GD could have pulled off a victory over Weston or, at least, made them sweat out a 1 or 2 goal victory. Yes, DS is a whole other level of lacrosse. One of the top 5-10 in the state at all divisions. Yet, besides a disastrous 2nd qtr, GD played them fairly close. IMHO GD and LIT will be as good as, if not better than Weston next year. Lots of returning firepower for each team while DS loses their two "go-to" guys for the past 2 years. BUT, the problem is DS! They are not losing much. They have 4 of their 5 incredible offensive threats back for next year. That should scare anyone in the state at any division. Great year for CMass Lax. Best of luck to those teams still in it.